On the surface, The Judge looks like it should be a homerun. However, the final product is an overlong, but enjoyable movie with serious identity problems. With a title like The Judge, audiences expect certain things. First and foremost, they expect a twisty and thrilling courtroom drama. Ironically, that’s the worst part of this film. What the movie is instead is a mediocre family drama loaded with oversentimentality and a tone that is scattershot at best. Hank Palmer (Robert Downey Jr.) is a hotshot defense attorney who plays fast and loose with the rules of law to win his cases. While in the middle of a trial, he receives a call that his mother has passed away. He returns home to a small town in Indiana where he comes face-to-face with his estranged father, Judge Palmer (Robert Duvall). 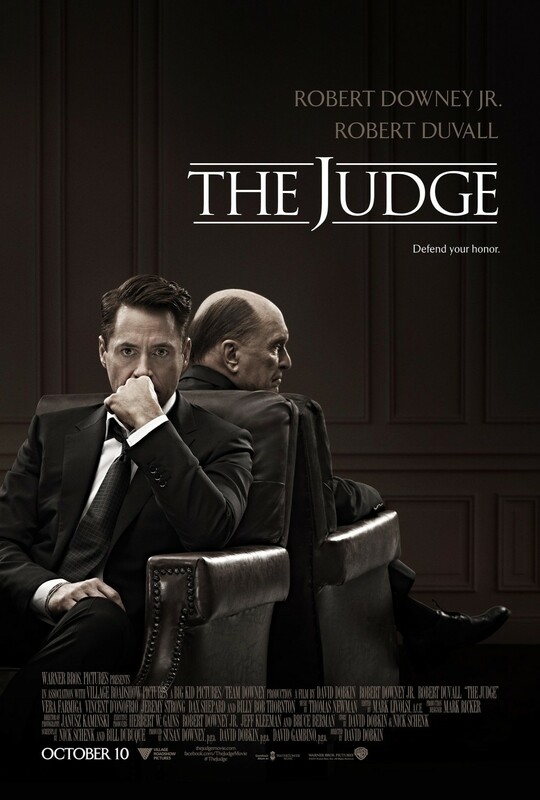 After the funeral, the Judge is involved in a traffic accident that results in the death of an ex-con who represents the greatest failure of the Judge’s career. Naturally, Hank ends up defending his father after a tortured negotiation. That’s story enough for one movie, but this one has to add Hank re-connecting with his older brother Glen (Vincent D’Onofrio) as well as his Rain Man-esque brother Dale (Jeremy Strong). Furthermore, he looks to rekindle with an old flame (Vera Farmiga) as his marriage is falling apart back home. And let’s throw one more log on the fire and have him learn to be a better father to his daughter Lauren (Emma Tremblay). On top of all that, the special prosecutor assigned to his father’s case (Billy Bob Thornton) has some vague axe to grind with Hank. It’s a lot to take in and leads the film to be way too long. I thought for sure that the script by Nick Schenk and Bill Dubuque, from a story by Director David Dobkin and Schenk, had to be based on a novel, but it turns out it’s just a meandering mess. Yet, despite all these issues, the film is entertaining. It strives for oversentimentality in a lot of scenes, but there are some very fine sequences to be found here. The problem is, none of the individual parts of the story are very strong on their own, so they are all crammed into the film to make it appear to be coherent. There are a lot of predictable elements as well, which didn’t help The Judge’s case—sorry, I couldn’t resist. The cast is an embarrassment of riches and everyone does their best with the material. Downey and Duvall are great together, but honestly, at times the different scenes they appear in felt like they were from two different movies. That’s a sign of a shoddy script and an inconsistent tone. Dax Shepard serves as the comic relief as a junior lawyer brought on by the Judge. Leighton Meester also puts in a memorable appearance. Vera Farmiga’s performance never seemed to match her character’s outer appearance, but it’s always nice to see her. Only Billy Bob Thornton felt completely out of place in this film. You don’t hire a heavy-hitter like him and then waste him in the tepid courtroom scenes this movie creates. Overall, while The Judge has its moments, it’s a film that doesn’t know what it wants to be. It’s really all over the place. The cast keeps the enterprise going until the running time reaches unbearable levels. It’s too much movie for a story that should have been an open and shut courtroom drama. Maybe catch it when it hits cable, but rushing to see it in theaters is unnecessary. This entry was posted in Reviews and tagged Billy Bob Thornton, drama, Film Reviews, Films, Hodgepodge, Judge, legal, Movie Reviews, Movies, Podcast, Robert Downey Jr., Robert Duvall, Vera Farmiga. Bookmark the permalink.